With the usage of Value Added Services on mobile devices in India increasing exponentially, Airtel has published the finding of its annual survey which gives insights on the patterns seen with mobile users. 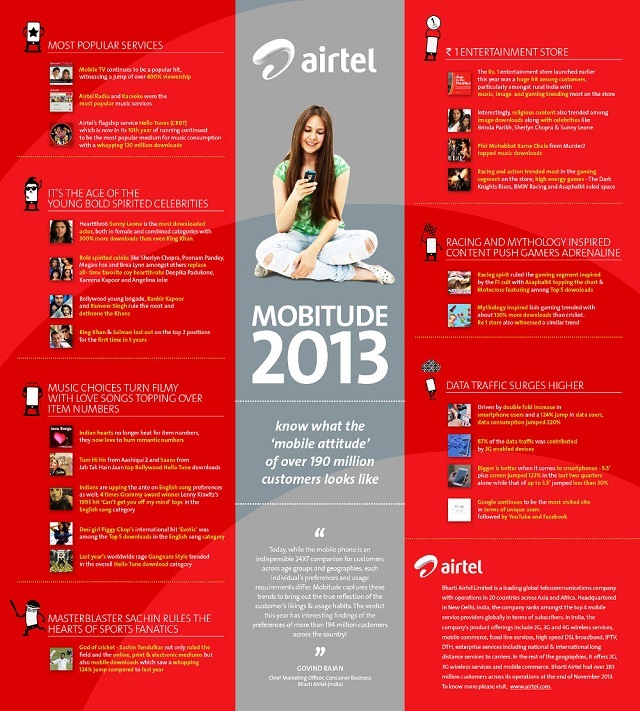 The Airtel Mobitude 2013, which is the 5th edition of Bharti Airtel’s annual survey of mobile trends in India, revealed that Value Added Services like mobile TV, Bollywood, Hello Tunes, Re 1 entertainment store and gaming received high preference from its over 190 million user base. The results point that Mobile TV in particular saw a massive 400 percent rise in viewership over the last year. The Airtel Mobitude survey shows that the number of data users has risen to 124 percent while the overall data consumption has touched 220 percent, of which 87 percent of the data traffic comes from 3G devices. Similarly the number of smartphones with screen sizes greater than 5.5 inches has crossed 123 percent. In terms of usage, Google is still the most visited site, quickly followed by Facebook and YouTube. Predictably, Sunny Leone topped the charts in the image download category, followed by Sherlyn Chopra and Poonam Pandey. Interestingly, the trio contributed more downloads than the total downloads of their male actors combined. In sports, Sachin Tendulkar dominated the downloads list, with a 124 percent rise compared to last year.